Desert Mountain Tribe kicked off their set with a distorted guitar sound from Jonty Balls, a heavy bass line from Philip Jaun and, finally, an almost languid drum line from Felix Jaun, all of which added up to and atmospheric droning and a very big sound for a trio. With Jonty’s vocals echoing around the venue (lots of echo, as evidenced by the fact that the effect was left on between songs, making the few times he spoke to the audience slightly off-putting) I was reminded of something that I couldn’t put my finger on until later in the set. With no introductions that I heard (and the set list on one website, for the previous night on the same tour, not only containing less songs than they played tonight but, apparently, a different order to my notes) I can only guess at some titles. With Felix hitting the skins a lot faster, Take A Ride saw the guitar and bass combine into a wall of sound from which neither was distinguishable. From the lyric “We all Die”, I suspect it was Heaven And Hell, during which the band were almost obscured by smoke, that brought to mind The Doors, although it might have just been a close comparison – something about the vocal style – rather than an influence. It was a short song but, even so, managed to fit in a false ending. An already impressive set continued to get better in its second half, which opened with another easy-going drum line behind powerful guitar. Way Down had a simpler, quieter start. With repetitive lyrics throughout it slowly built in volume, pace and power into a superb live track. The final track of the set had an even quieter start, almost atmospheric. Then Felix hit the drums harder than he had done previously to signal the start of a louder section which faded back to another quiet section of just guitar and vocals before this brilliant track built the set to an epic climax. It’s still early in 2016 but Desert Mountain Tribe may well have just taken my “favourite support act of the year” slot. “You know this is going to sell out” proclaimed Fibbers’ website. Well, I managed to pay on the door and, during the support slot (which, admittedly, did start earlier than normal) the crowd seemed to be of fairly average size. During the gap between bands, however, a lot of people moved forward of my usual spot. Even so, it wasn’t until the end of the gig, as I joined the slow moving tide towards the exit, that I realised that the venue was fuller than, I think, I had ever seen it. Gone was the usual free space right at the back. It was a mixed crowd of young and older – with hairstyles running the gamut from Mohicans to dreadlocks almost long enough to sit on – and one that, throughout the night needed little encouragement to participate. More often than not there was a sea of raised arms in front of me and each of the headliner’s song was greeted with louder and louder cheers. The lights being dimmed roused an initial, small cheer of anticipation, but there was still a few minutes to go before one of the roadies, flashing a torch as he walked across the stage like a moving lighthouse, signalled that Reef were ready and they came on to bigger cheers, Gary Stringer immediately moving to the very front of the stage, clasping the hand of one person in the front row and flashing a thumbs up to the rest of the crowd. 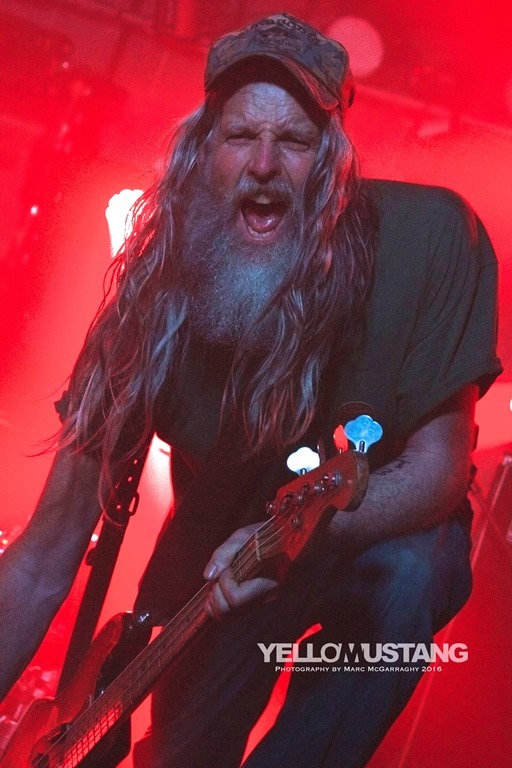 Stringer had been interviewed in the local press before tonight’s gig and, referring to playing different sized venues, was quoted as saying, “…you can get just as much of a buzz playing at a place with people in your face just the other side of the barrier,” something evidenced by the fact that, after prowling and dancing around the stage during the opening track, he returned to the front of stage, and crouched down to be at the same level as the crowd, literally singing in their faces. 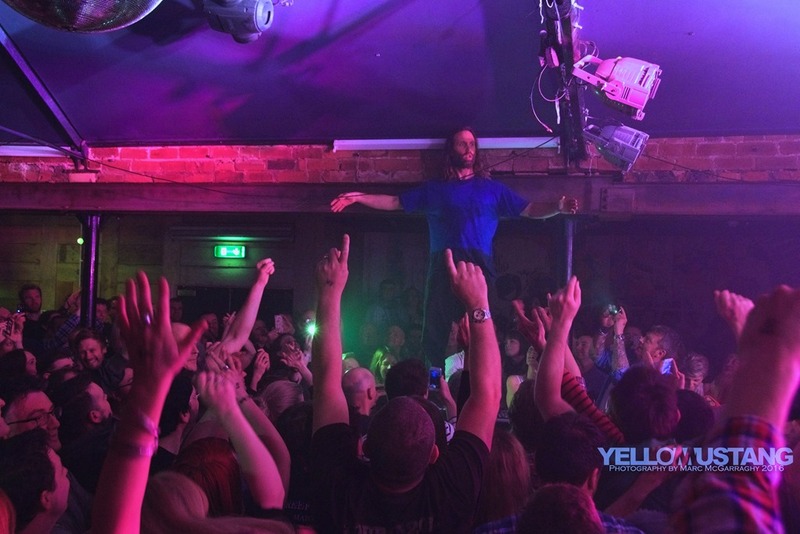 “It’s nice to be in York,” he proclaimed as that opening track ended, before deciding, in what was to be a recurring theme of the night, to use the fixtures and fittings as part of his act and reaching up to swing from the metal beam above the stage that so many other artistes have taken such pains to avoid hitting. “Come on York, make some noise,” he shouted during Higher Vibration, and the crowd duly obliged. That beam came into play again soon afterwards, becoming an impromptu mic stand during the next track, while Come Back Brighter saw the crowd engaged in their first spontaneous sing-along. Dominic Greensmith provided a rat-a-tat drum opening for Stone For Your Love, during which bassist Jack Bessant moved about his section of stage, his long hair and beard making him look for all the world like a wild mountain man who had wandered into the wrong band but who somehow still manages to fit in. The cheers at the end of each track were almost deafening by now and it seemed an appropriate time to slow things down a bit with a new track and its nice guitar line from new boy Jesse Wood. The quieter section continued with I’ve Got Something To Say, with Stringer, standing still for a change, opening the track on acoustic guitar prior to the rest of the band coming in. Consideration saw another mass sing-along as Stringer encouraged the crowd to join in with “It’s gonna be all right” to see the track to its close. Spotting another fixture that he could use, Stringer, with microphone lead around his shoulders, eschewed all thoughts of health and safety when, during I Would Have Left You he clambered off stage and onto the little drinks stand just to its left, standing on it as though crucified before throwing the microphone back on stage. In a set of gravelly vocals and powerful rock music, Lucky Number somehow seemed even more raucous, its ending greeted by chants of “Reef! Reef! Reef!…” from the crowd. The opening notes of the next track brought forth huge cheers, a lot of bouncing in the audience and another spontaneous sing-along. It was, of course, Place Your Hands (still the only Reef track I recognise after being “educated” a few years back when, after seeing Stringer Bessant live, I admitted that I knew nothing about Reef). After the band’s biggest song their keyboard player, whose name I didn’t catch, despite Stringer giving him an accolade earlier in the set, switched to banjo for My Sweet Love, another new track, during which Stringer unselfconsciously discarded his sweaty t-shirt. Don’t You Like It saw Bessant getting more animated than usual during its drum then guitar opening. So far I haven’t mentioned the incredible lighting. Reef are, I think, the first band I have seen at Fibbers who have brought their own full lighting set. At times, as it threw blue, green, yellow, white or purple beams across the stage, it seemed almost too big for the venue, yet still managed to produce an stunning effect. As the band recovered in the green room after the final song of the set, there were as many chants of “Reef! Reef!…” as there were shouts for “More!” and, once again, a deafening cheer as they returned to the stage for a three song encore that ended with Jerome and started with two tracks I, unfortunately, can’t identify. There were shades of the sound of AC/DC to the vocals of the first and the second saw a roadie have to come one to replace the battery pack of Stringer’s monitors. Presumably they were as exhausted as he must have been after his energetic performance. Those monitors were discarded completely during Jerome, during which Stringer conducted an almost obligatory clap-along before returning to that beam for a full-on swing session which could easily have seen him crash into the drum-kit or the audience. Thankfully neither happened. Once again he spun the microphone around the beam and managed to drop it while doing so, which saw him flash a guilty look off stage. Wood used the dangling mic to name-check the band members before a final hit from Stringer as he left the stage saw it spin over the beam, leaving a challenge for whichever roadie was to retrieve it. A brilliant night from a resurgent band. This entry was posted in Live Music and tagged Desert Mountain Tribe, Fibbers, Reef. Bookmark the permalink.